With CES 2018 in full swing, the types of products that you get to see everyday will never cease to amaze you. The new Kodak Mini 2 Instant Photo Printer is one such product which was launched today and allows users to print cute, high quality photographs on the go. While the real life application of this nifty product is yet to be fully justified, what Kodak has done will definitely impress even the most demanding customers. By making use of this $99 printer, you will be able to print credit card sized photographs with a simple measurement of 2.1” x 3.4”. It makes use of 4Pass dye sublimation printing technology to deliver high quality photographs and the size of the printer is no more than an average hand size of a person. In terms of connectivity, the device is on par with most of the other devices available in the market these days. 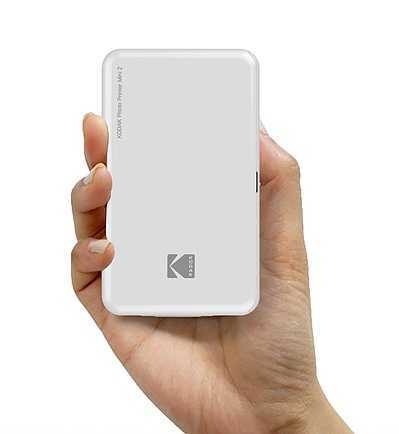 The Kodak Mini 2 photo printer allows users with iPhones and iPads to print photos using the Bluetooth technology.Android smartphone users and tablet users can do the same making use of the NFC One touch technology by simply tapping their device with the printer to initiate a connection. They can also send files to the device with the help of Bluetooth connectivity. Smartphone users can make use of the Kodak Mini Shot app available on both iOS and Android devices. The app makes it easier to grab all the photographs from the camera roll so as to start printing it directly, send photos from Facebook, Instagram among other platforms to directly print, Google images and they can even print video screenshots captured on their smartphones. Everything sounds intuitive and convenient to use so far. The Kodak Mini Shot app is a convenient choice because it comes bundled with a range of filters, cropping options, the ability to change how a photo looks before it is sent to print. The idea is to carry this device to parties so that you can print celebrations on the go and gift multiple photographs to those in the group. From a professional photographer’s perspective, the Kodak Mini 2 Instant photo printer is not going to make any big difference in the way they work because all photographs are as small as a credit card and can only be kept as a souvenir than an actual album as people usually do to preserve memories.